20 Fantastic Benefits for Spending Sometime in Silence - Something New Everyday! For over two years I spent one out of every four weeks in silence. At the time I was living at a Zen Monastery and every month we would have a week-long silent retreat. During this retreat we sat meditation in silence, ate in silence, worked in silence, and only communicated through hand gestures and written notes. At first living like this was hard, but over time I learned to grow to appreciate silence. By the time I left I learned that silence was my friend and teacher. 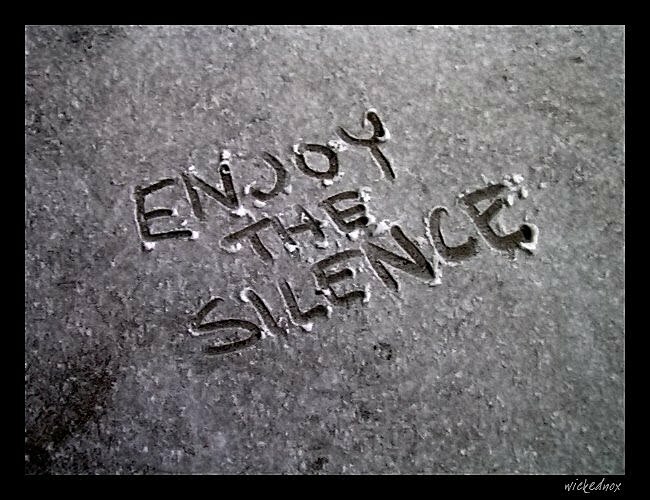 What did silence teach me? I used to think I needed to watch TV every night. But at monastery I went without and discovered I didn't need it. Silence taught me to be happy with less. Pick something that's weighing you down and let it go. Your life will thank you. When you can only talk by writing a note, you only say what's important. Before the monastery I talked a lot but said little. Silence taught me that a few simple words well spoken have more power than hours of chatter. Think of one simple thing you can say that would help someone feel better and say it. Being able to speak makes life easy, but when I couldn't talk I learned how much I relied on others. Silence taught me to appreciate the value of relating to others. The next time you see your friends or family, try to really listen. Deep listening expresses deep appreciation. Several times at my first retreat I thought my phone was vibrating. But then I would remember I didn't have my phone. It showed me how my phone divided my attention. Silence taught me how important it is to let go of distractions. The next time you are with someone you care about, try turning off your phone and putting it away. It will make paying attention easier. I once sat a retreat next door to a construction project. What amazed me was how easily my thoughts drowned out the noise. I realized if my thoughts were this loud, I'd better make them as wise as possible. Silence taught me the importance of shaping my thinking. Take time each day to notice your thoughts and let go of thoughts that don't serve you. Because I sat retreat in every season, I know that the sound of wind in fall is different than it is in winter. Silence taught me to notice nature. Take a short walk outside in silence and you'll discover the wisdom and peace that nature has to offer. During retreat I noticed that whenever I got lost in thought, I lost track of my body. And when I focused on my body, my thoughts would calm down. Silence taught me to be in my body. Close your eyes and ask, "What sensations do I feel in my hand?" Learning to feel your body can calm your troubled mind. Whenever I went into town after retreat, the world seemed so loud and fast. I came to realize how much our senses have to process most of the time. Silence taught me the importance of reducing the stimulation. Enjoy some quiet time everyday. The less you see and hear, the more settled your mind can become. People would come to the monastery and remark how quiet it was. But living at the monastery I knew all the noises, from frogs, to owls, to the sound of sandals on the sidewalk. Silence taught me that the world is a rich texture of sounds. Sit in front of your house and close your eyes. You'll be amazed at what you hear if you listen long enough. During retreat I was surrounded by imperfect people who were doing their best. Some were happy, some were sad, but all were wonderfully human. Silence taught me that people display great beauty. Find a good spot to people watch with an open heart. What you see may inspire you. For a long time anytime something difficult came up, I would just distract myself. But retreat taught me that if I avoided something it would never go away. Silence taught me that space helps me face hard times. The next time you face something difficult, pause and honor whatever's arising. I used to think love was this big thing. But in retreat I found that I felt love for so many things. Silence taught me that love can be simple. Think of someone you haven't said I love you to recently and tell them. I used to think courage was about facing danger, but during retreat I realized that real courage is about facing yourself. Silence taught me the courage it takes to be still. When we stop moving everything we're running from catches up. The next time you are afraid, stop and wait for it to pass. There is immense courage inside your heart. Every retreat reminded me that speaking is easy, but staying quiet is hard. 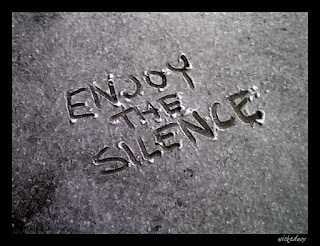 Silence isn't flashy, but it has an immense power to endure. The next time someone doubts you, instead of disagreeing, silently vow not to give up. Action speaks volumes. I often ask for reassurance or feedback. But living in silence meant I had to trust my instincts. Silence taught me to have faith in myself. The next time you begin to feel anxious, sit in silence and see if you can find the space of deep faith that lives in your heart. I used to lie so I wouldn't have to explain myself. But when I couldn't talk I began to notice this impulse and how much it degraded my integrity. Silence taught me the importance of telling the truth. Notice times where you tell little lies and try telling the truth instead. It isn't always easy but it's the first step to trusting ourselves and others. During retreat I didn't have a lot of comforts. It helped me see how much I took for granted and how much I had to be grateful for. At the end of every day sit in silence and ask yourself what am I grateful for. You'll be amazed at the blessings you discover. I used to love drama and conflict. But at retreat I found I was happier when I kept it simple. Silence taught me that simplicity and joy are close companions. Pick one space in your home you could simplify. Keep it simple for one month and enjoy the ease it offers your life. I used to think I had to talk in order to feel connected. I realized during retreat that I can feel connected just by being near people I care about. Silence taught me that words can get in the way. Do something in silence with someone you love. It will be awkward at first but eventually you will see what it means just to be in someone presence. I studied philosophy in college and I thought I could read about truth. But retreat taught me that truth is found in silence. Silence has taught me a deeper truth than words ever could. Sit in silence once a week and feel the truth in your heart. It's there whether you can express it in words or not.